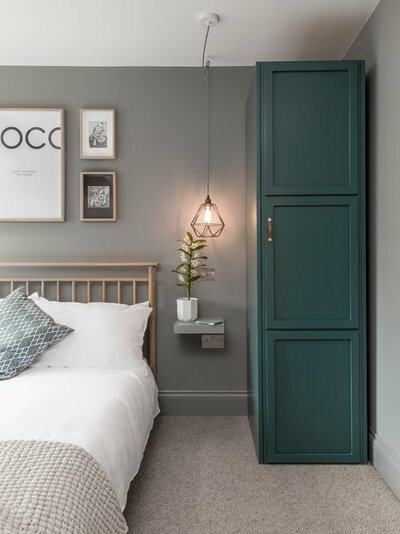 They take up a lot of space and, after the bed, tend to be the most dominant feature in a bedroom, so a wardrobe that fits in with the rest of your scheme – or stands out and makes a design statement – is key to its success. 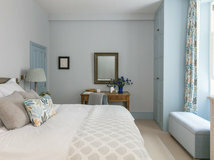 This built-in wardrobe has been painted a pretty pale blue to match the rest of the woodwork and trims in the bedroom. 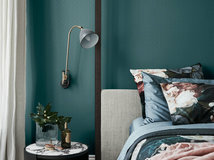 Choosing a darker shade than the one on the walls adds a contrasting element to the scheme and makes a nice change from the more standard white. When painting wardrobe doors, paint with the doors open and then again with them closed to make sure you don’t miss any bits. 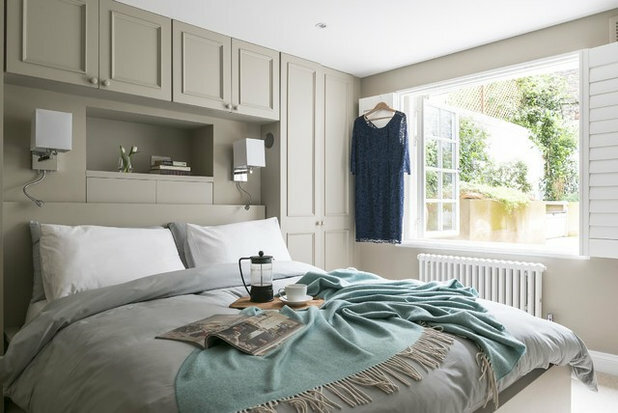 Here, a whole wall of built-in wardrobes has been painted a deep shade of grey, complementing the other dark tones in the room and making the cupboards into more of a feature. Chalk-style paints work on almost any surface, so can normally be used on wardrobe doors that have a man-made finish. It’s worth experimenting with a small tester pot of paint on an inconspicuous area first (inside is ideal) to make sure you’re happy with the finished effect. 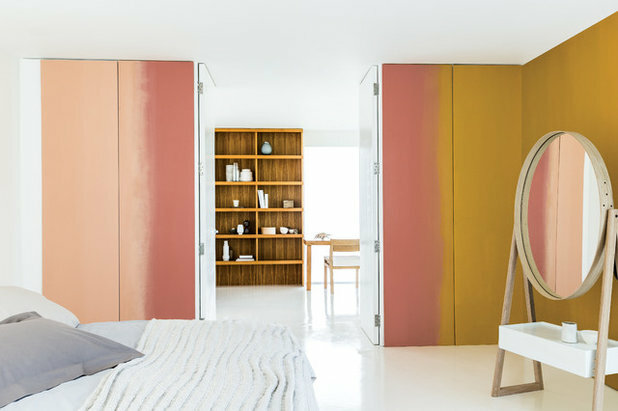 A flush wardrobe door with no trims or large handles is a good place to experiment with a modern paint effect, such as this ombré technique. Choose two or more tonal colours then graduate one into the other – there are lots of guides online to show you how best to blur the edges to get just the right look. Don’t be put off from trying a deep colour, especially on a slimline wardrobe. 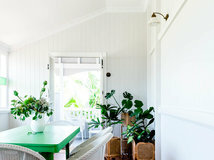 This dark green creates a very different feel in the room than if the furniture had been painted white or a paler shade. Using a small roller can help to get a smooth finish on woodwork, and remember to prepare the surface and area properly before painting and remove any handles first to make the job easier and give a more professional finish. How Do I… Choose and Care For Paintbrushes? 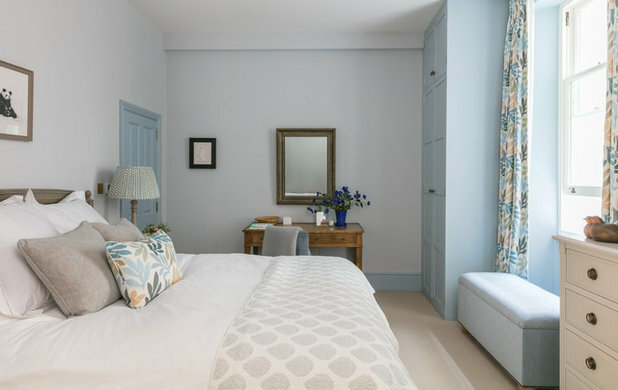 To help built-in wardrobes with lots of moulding and panelling blend in, try painting them the same colour as your walls. This can be especially useful in a small bedroom to stop the cupboard doors looking too fussy and overwhelming the space. 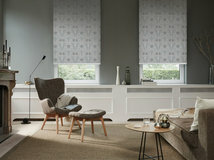 A neutral colour like the one seen here is a good choice in a compact room, as it helps create a calm feel. 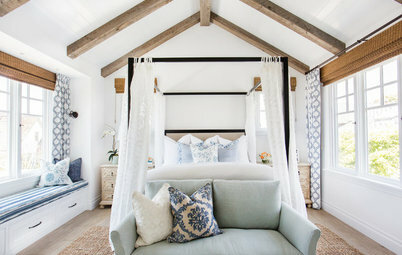 Bed linen in a similar shade completes the serene look. This huge cupboard has been painted with a glossy finish, but there are lots of paint types to choose from, including ultra-matt and mid-sheen satin finishes. 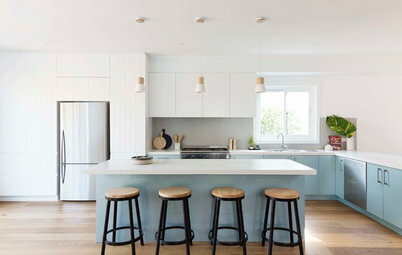 Check with your favourite paint store about the best type of paint to choose for your project. 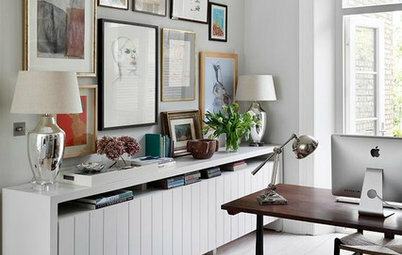 Of course, wardrobes don’t have to be confined to the bedroom – this one has been repurposed for living-room storage. 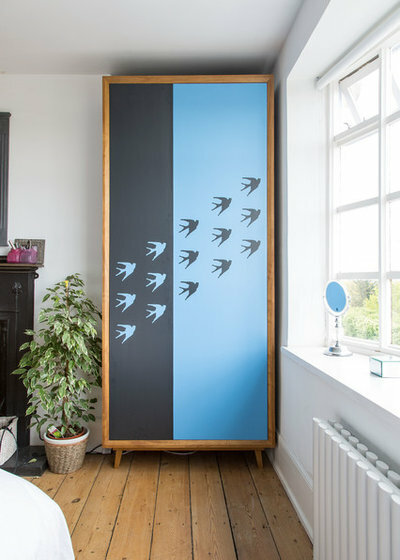 If you’re feeling artistic, the large expanse of blank space provided by a wardrobe can be the ideal spot to add an individual touch to a room scheme. Whether you’re going for a freehand pattern, stencils or letters, mark out the design first using masking tape to section off areas, then get creative. If you get bored with the design, you can always just paint over it. If you’re worried that a strong colour will be too dominant, try painting just the doors instead. This stops the wardrobe from looking too ‘blocky’. 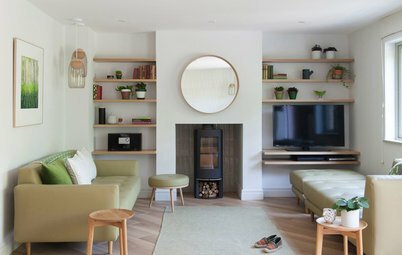 It’s also a good option for a built-in cupboard, where it would be difficult to get to the sides to paint them properly, or for a heavy piece of furniture it would be tricky to drag out, as seen here. On a run of built-in wardrobes, leaving the frames around the door panels white breaks up the expanse of colour, adding another level of interest. 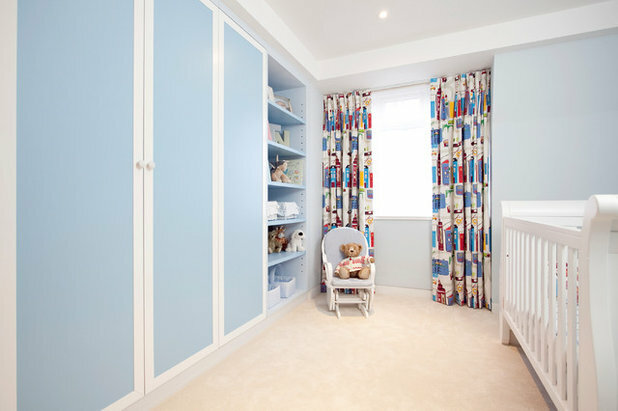 In a child’s room like this, you could even use different colours on the separate door panels. 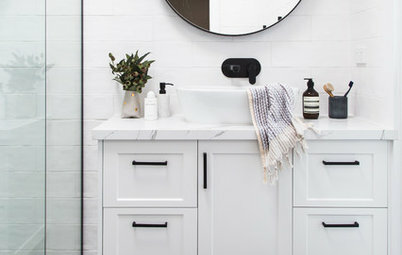 Replace any overtly ornamental handles with unobtrusive white knobs to keep the look clean and simple. Have you painted your wardrobe? Share your tips and ideas in the Comments below, like this story, save your favourite images and join the conversation. 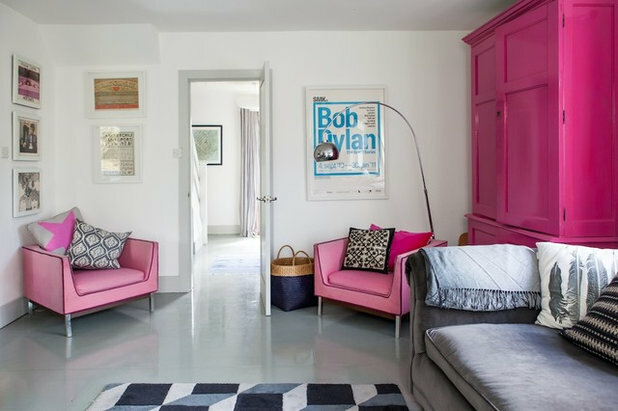 Bev Hine - leave the furniture as it is - great colour! I would then add this years key colour, coral, in the bedroom - they would compliment each other beautifully! I love the collection of colours in this article! Bev Hine - your wardrobe is amazing! Especially the way you built it in. Using the olive colour together with classic british moldings is so wonderful! 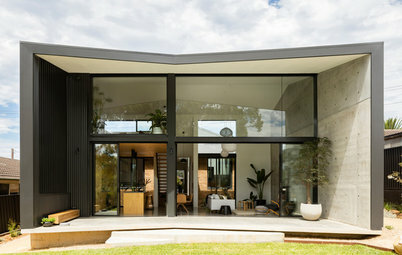 And, I am impressed by the wardrobe heading - combination of open shelving and door cabinets is just perfect.